How to show upoladed image from one form to another form? How can I show an image uploaded in form 1 in form 2. But I do not see hos to pass an uploaded image and how to show it. Using that guide you linked on your post, you can pass the URL alone (this would be in text/string format). But, I'm afraid you won't be able to display the image itself within the form. There is a way to display an image that was uploaded from another form but this has to be done manually. What you need is the URL of the image, which you can get from the SUBMISSIONS PAGE, then use that same URL when adding an IMAGE FIELD on another form. But even for the URL I do not see how to pass it to another form: I do not see the "Field details/Unique Name" section in the File Upload Properties. Do you know how I can get that URL? I assume this is the form you're working on https://www.jotform.com/73085881584367? 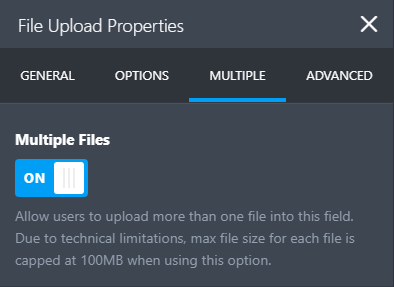 The FIELD DETAILS section will only appear if you're using a single file upload field. Toggle the MULTIPLE FILES option from ON to OFF then go to the ADVANCED tab to grab the field name and ID.